Pink White Stripes. Pretty Fitted Short Sleeve Shirt. Cash accepted only if item is to be picked up. M&S Collection. Spare Button. A-wear Ladies Shirt Size 6. Condition is Used. Dispatched with Royal Mail 2nd Class. Tommy Hilfiger Women’s Fitted Shirt UK Size 10 (US size 6). From a smoke free home. Dispatched with Royal Mail Signed For® 2nd Class. Can post internationally. Please message before bidding to confirm postage costs. The blouse is a size 12 and is black in colour with a black and white striped collar and striped hem. Great 2 in 1 Top. The blouse has a small back zip. Great for any occasion. Really lovely quality Austin Reed ladies shirt. Excellent, top quality shirt in cotton. Stripes are lilac/lavendar and white. Long cuff with cufflink holes or could be folded back. Wealth of Nations green striped cotton tiewrap shirt with curved hem; tie slots through side seam to tie at side; Smart, understated, but quirky style - fitted with back darts & bust darts, sleeve cuffs have cufflinks (mother of pearl - see pictures) size 14: underarm to underarm 21"/54cm, nape of neck to hem 22"/56cm, sleeve seam underarm to cuff edge 20"/51cm. Dispatched with Royal Mail 2nd Class. Ladies Ralph Lauren Black/White Stripe shirt Size L. Underarm to Underarm 20" Neck to Hem 26" Excellent Condition Pertect for work or smart casual Dispatched with Royal Mail 2nd Class. Marks & Spencer. Striped Shirt. Ivory & Black. 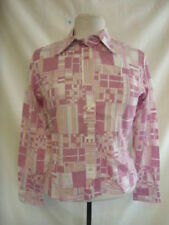 Hawes and Curtis Hipster Pink Stripe Ladies fitted Shirt. Size 14. 3/4 Sleeve. Button fastening down the front. Deep classic collar. Condition is Used but in excellent condition. Dispatched with Royal Mail 2nd Class. Ladies H&M Shirt, Lilac And White Striped, Size 10. Excellent condition and from a smoke free home. We’re having a clear out so please do take a look at my other items. Dispatched with Royal Mail 2nd Class. FRILLS DOWN. MARKS & SPENCER. BUTTON FRONT. LENGTH 22". LONG SLEEVE. AND ON CUFFS. Worn a few times but in great condition! Little creased in the photo but it’s been folded in my drawer for a while! Stripe H&M Top - SIZE 14. Condition is Used. Dispatched with Royal Mail 1st Class. Karen Millen cream stretch floral applique striped work blouse shirt top size 14. Flattering use of striped fabric in spring green, cream and brown/gold accents. As with all Karen Millen sizing, I’d say it’s a small 14. Beautiful top, perfect for spring/summer office wear and looks great with jeans for a weekend look. This is used, but has been sat in my wardrobe for a while as it just won’t fit me any more. I loved wearing it! Time for it to make someone else feel amazing :) Dispatched with Royal Mail 1st Class. M&S Purple/White Stripe, Frilled Neck Blouse/Shirt. Excellent condition. Dorothy Perkins Short Sleeve Grey Striped Blouse Size 14. V neck with a bow to tie. New without tags. Dispatch with Royal Mail 2nd Class. 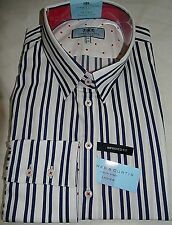 M&S Limited Edition Blue & White Striped Shirt Deep Cuffs - Size 10 RRP £29.50. Condition is Used. Dispatched with Royal Mail 2nd Class. Kate Moss Topshop Fitted Shirt, size 12, stitching detail at back. Kate Moss Topshop Fitted Shirt, size 12, stitching detail at back.. Condition is Used. Dispatched with Royal Mail 1st Class. T M Lewin Ladies Striped Shirt/blouse Size 16 worn once. Condition is good. If you buy more than one of my items at the same time you will pay for only 1 postage fee. Best to use the offer facility to checkout at the same time. no returns or refunds as the monies are going to a dementia charity so if they arent suitable sell them on, you will probably make a profit. Postage within 14 hours of payments. NAUTICA white Shirt, Adjustable Sleeves, Size Large , New with Tags. Condition is New with tags. Dispatched with Royal Mail 2nd Class. This is a lovely blouse that has a nice top gold button. 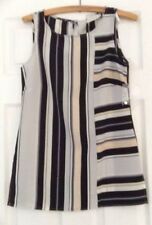 striped shirt, black and white, silky, topshop tall, size 12. Condition is Used. Dispatched with Royal Mail 1st Class. A GREAT SHIRT FOR WORK WITH SKIRT OR TROUSERS BUT LOOKS EQUALLY COOL TUCKED INTO SKINNY DARK JEANS. LOVELY BABY PINK COLOUR. 100% COTTON WITH A VERY FINE STRIPE. No peep feature. M&S Collection Blue/White Stripe Blouse/Shirt. Lovely satin sheen blouse. Great for office, evening or party. 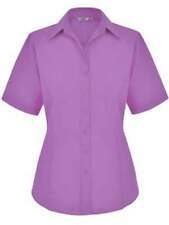 With button up collar and concealed front button fastening blouse has a lovely soft sheen. A fitted style and turn back cuffs giving a very feminine look & feel. Hawes & Curtis Womens hipster Blue/purple Shirt Size Used. Excellent condition Dispatched with Royal Mail 1st Class. 3/4 sleeves. Pink/ lilac stripes. Poly cotton mix. 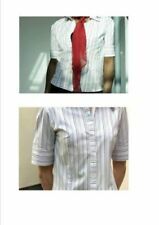 Buttons into V neck. Freshly laundered and ready to wear. In excellent condition. Sky Blue with Fine White Stripe. Tailored fit. Italian textile 100% cotton. Italian woven textile gives a lovely sheen to the finish. Machine washable. One button darted cuffs. Reduced to sell.Ladies top size 26 blue with stripes, Debenhams "The Collection"
Thomas Pink fitted shirt size 10, finest cotton range. Pink with green and purple stripes. Button cuffs - no need for cuff links. Pet and smoke free home. Condition is used and excellent condition. Dispatched with Royal Mail 2nd Class. Please see my other items as I’m having a clear out. Ladies H& M Pink Strip Shirt. Condition is Used. Dispatched with Royal Mail 2nd Class. Length (shoulder to hem) approx: 27". T M Lewin Ladies Striped Shirt/blouse Size 18 worn once. Condition is good. If you buy more than one of my items at the same time you will pay for only 1 postage fee. Best to use the offer facility to checkout at the same time. no returns or refunds as the monies are going to a dementia charity so if they arent suitable sell them on, you will probably make a profit. Postage within 14 hours of payments. Long sleeve. Condition is good preloved. Nape of neck to hem 27". Underarm to underarm 21". F Sticky Fingers Signature. White, lilac, pink and mocha stripe blouse. Size 14. F Sticky Fingers Signature. White, lilac, pink and mocha stripe and ruching blouse. Machine wash. Armpit2armpit - 18" arm length - 17.25" length - 22.75". 68% cotton and 32% polyester. In good condition.